Analysts have started sending out iPhone sales projections for the last quarter, and Morgan Stanley analyst Katy Huberty is among those who have stuck with their earlier estimates, despite the high first-weekend sales (via Fortune). According to her forecast, Apple sold 34.5 million iPhones between July and September, although she suggests this number may be closer to 37 million due to high demand, although there were some supply constants. The analyst forecasts four essential moves for Apple for the holiday quarter: iPad refresh, cheaper iPhones, new services based on the fingerprint sensor, and potentially the iWatch. “Apple is becoming a clean story again with upside to our estimates, signs of meaningful innovation in iOS 7 and 5s, strong positioning for the next computing cycle, and rebuilding of the management bench — all signs of a positive trajectory in FY14. We are buyers into a strong Sep Q print,” she wrote to investors. The iPad refresh will likely come on October 22, as Apple has scheduled a special event for that date. 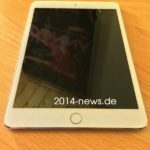 Huberty believes an iPad mini refresh isn’t likely (no Retina? ), but the 9.7-inch iPad would give the much needed boost after Apple tablet shipments fell in the June quarter, she says. With the fingerprint sensor branded as Touch ID now out in the wild, Huberty sees an opportunity for Apple to launch new services based on the freshly implemented security layer: iCloud Keychain and iBeacon would make the ecosystem even stickier and differentiated, she says. Finally, she brings the iWatch into focus once again, predicting that Apple will likely present its new innovation, the highly anticipated smartwatch.